On 27 February the Crimean crisis escalated as armed protesters, denounced by the Ukrainian authorities as ‘terrorists,’ took control of the regional parliament and government. During the clashes between pro-Ukrainian and Russian separatist groups, two people died and over thirty were wounded. If the Ukrainian authorities over-react with force this could lead to Russian intervention by Black Sea Fleet personnel. Acting President Oleksandr Turchynov warned that if Black Sea Fleet units leave their bases it would be viewed as an act of aggression. Is this becoming a zero-sum game? In the 1994 Budapest Memorandum signed by five nuclear powers, when Ukraine agreed to disarm its nuclear weapons, it received security assurances; and if Ukrainian sovereignty is threatened, the country can call for consultations with NATO under the 1997 NATO-Ukraine Charter. Journalistic speculation about an East-West split in Ukraine misses the point. Ukrainians are an ethnic majority throughout the country, except in the Crimea; and a split between Russian and Ukrainian speakers is unlikely. Why? Because there is no clear dividing line between the two groups; for example, most children attend Ukrainian-language schools in Kyiv, and yet any visit to the city will show it as largely Russian speaking. Similarly, as You Tube videos will readily testify, the Euromaidan included as many Russian as Ukrainian speakers. Two decades of speculation about Eastern Ukraine splitting away have, therefore, been wrong. There are, however, two caveats to this. Firstly, it makes greater sense to divide Ukrainians according to their identity rather than their language. Two regions of Ukraine have pronounced Soviet identities – Crimea and Donetsk [in the east of the country]. These two regions also happen to be the bastions of the Party of Regions (PoR) and the Communist Party of Ukraine (KPU). Soviet identity strongly supports integration into a Russian-led Customs Union, the precursor to the Eurasian Union. It also supports authoritarianism, with a third of Ukrainians prioritising stability over democracy. Such Soviet identity voters form the main strongholds for Vladimir Putin and Alyaksandr Lukashenka in Russia and Belarus respectively. But even here there is a generational divide – young Ukrainians in eastern Ukraine support European integration. The second caveat is the Crimea, the only region in Ukraine with an ethnic Russian majority; the region was ethnically cleansed of its Tatar population by Joseph Stalin in 1944, on the trumped-up charge that they had ‘collaborated with the Nazis.’ In 1954 Khrushchev transferred the Crimea from the RSFSR [Russian Soviet Federal Socialist Republic] to Ukraine on symbolic and geographic grounds. 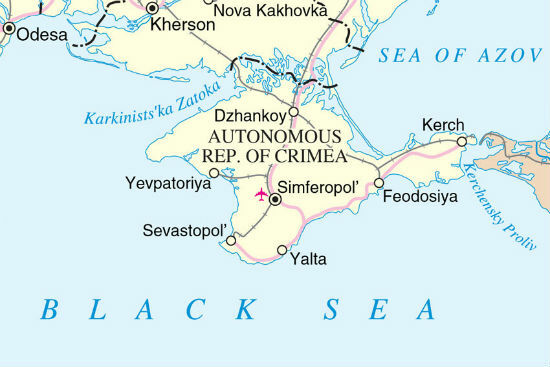 In 1990-1991, Crimea successfully upgraded its status from oblast (Soviet region) to autonomous republic; and Russian nationalists were soon agitating for union with Russia. Since the late 1980s, returning Tatars, who understandably are both anti-Soviet and anti-Russian, have supported the retention of the peninsula within Ukraine. [i] During this week’s clashes and protests outside the Crimean parliament, Tatars have formed the bulk of the pro-Ukrainian protesters. Presidents Leonid Kuchma (1994-2005) and Viktor Yanukovych (2010-2014) were both elected primarily by Eastern Ukrainians, but their approaches to the Crimean question were very different. Kuchma fought, undermined and marginalised Russian separatists; Yanukovych brought them in from the cold and forged an alliance with them. In the mid-1990s, Kuchma abolished the one-year old Crimean presidency, and until 2005 Crimean separatists played little part in local politics. In 2006, however, the PoR fought the Crimean parliamentary elections in the ‘For Yanukovych!’ bloc with Crimean Russian nationalists. Konstantin Zatulin, a leading Putin spin-doctor, played a key role in the behind-the-scenes negotiations. As Russia’s relations with Ukraine deteriorated under what Moscow regarded as ‘nationalist’ President Yushchenko [2005-10], the FSB [Russian security service] and GRU [Russian military intelligence] expanded their covert support for Russian nationalist extremists in Odesa, and Russian separatists in the Crimea. The Security Service of Ukraine (SBU), still a largely Soviet-era bloated and corrupt institution, was called upon to combat the covert activities of Russian intelligence. Two Russian consuls were expelled from Simferopil and Odesa,[ii] and the FSB[iii] was expelled from the Black Sea Fleet. These actions caused a massive deterioration in Ukrainian/Russian relations. President Dmitri Medvedev sent a highly accusatory open letter to Yushchenko, laying out all the demands Russia expected the new Ukrainian president to fulfill. In 2010, Yanukovych’s Russian-brokered alliance with Crimean Russian nationalists was further developed in the local elections of 2010 (building on what had been agreed in 2006) and the parliamentary elections in 2012. 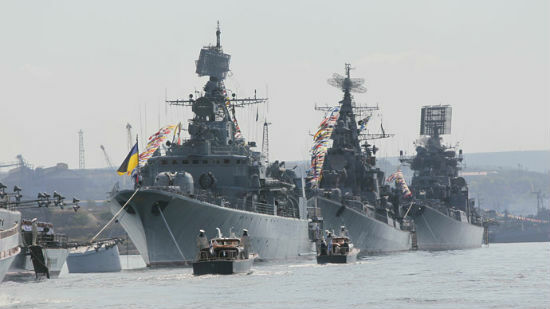 Leaked US cables from Kyiv in 2009 testify to the willingness of a Yanukovych presidency to agree to Russian demands: extend the Black Sea Fleet agreement (April 2010), known as the Kharkiv Accords, return the FSB to the Black Sea Fleet (May 2010), end support for NATO membership (July 2010), and agree on a consortium managing the all-important Ukrainian gas pipelines (December 2013), although there was always disagreement over whether there would be an equal split between the Ukrainian and Russian sides. 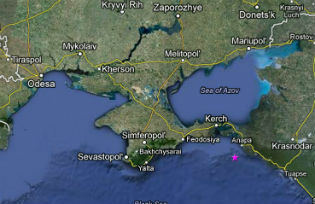 Sevastopol is the principal base for Russia’s Black Sea Fleet. During the 2013-2014 Euromaidan political crisis all of the above became fertile ground for a resurgence in the demands for Crimean separatism, and a revival of external Russian covert intervention in the Crimea. In the aftermath of the recent regime change in Kyiv, when Yanukovych and his entourage have fled and criminal charges have been brought, protests in the Crimea have returned to the demands last heard in the first half of the 1990s, for independence and unification with Russia. Russian flags, for example, have been installed on public buildings such as the Crimean Supreme Soviet. The numbers of Russian paramilitary Cossacks have also increased as they arrive from Moldova’s disputed enclave of Trans-Dniester – a frozen conflict – and Russia’s northern Caucasus. These paramilitaries, coupled with intelligence and military personnel from the Black Sea Fleet, often dressed in civilian clothes, have swelled the crowds. Leaked documents published by the Deputy Head of the Parliamentary Committee on Combating Organised Crime and Corruption, former Deputy Interior Minister Hennadiy Moskal, unequivocally show that Russian advisers assisted Ukrainian police special forces and the SBU in their violent attacks on protesters. [iv] Thus, there is little need for external military intervention when there are already Russian forces on the ground, coming from both local establishments and nearby conflict zones. After those elections, the PoR and its Crimean Russian nationalist and Communist allies set about fanning anti-American and anti-NATO feelings in the Crimea: they prevented military exercises, and mobilised opposition and hatred for the ‘Orange’ administration who were depicted, in a return to Soviet ideological parlance, as ‘fascists.’ Not surprisingly, when Yanukovych was elected he quickly signed the Kharkiv Accords, confirming the Black Sea Fleet base in the Crimea, and introduced the other measures indicated in the leaked 2009 US cables referred to above, while continuing to mobilise his core voters against opposition ‘fascists.’ Before 2006, the Party of Regions had no base in the Crimea, but now it is installed in every locality. In 2010, ninety percent of Crimeans voted for Yanukovych. Yet the PoR finds itself in a quandary. On the one hand, it would like to pander to its voter constituency which it has been feeding with anti-American and anti-‘fascist’ (opposition) rhetoric – in the Crimea and Russia it is widely put about that Euromaidan is funded by the US. On the other hand, now that half the PoR national parliamentary deputies have defected, there is a very real threat that it will disintegrate. There is also the external threat that it will be closed down for any number of valid reasons: cooperating with Yanukovych in abuse of office, destroying Ukraine’s democracy (on 16 January, the PoR and the KPU unlawfully railroaded anti-democratic legislation through parliament on a show of hands), and murder. Furthermore, oligarchs and business magnates who backed and gained financially from the PoR are also feeling the political heat, and would not want to be seen to be supporting separatism. The Party of Regions is therefore now seeking to portray itself as a patriotic party, condemning Yanukovych and putting itself in opposition to the new leaders, while also standing for Ukrainian territorial integrity. Ukraine’s first three presidents have sharply criticised Russian interference, so this re-positioning is imperative. Other political forces in the Crimea remain weak. Centrist parties active in the Kuchma presidency have been co-opted by the Party of Regions. The national democratic opposition never had strong support, and the Tatars voted for a number of different parties: the [centre right, national-democratic] Rukh, the Popular Movement for Reconstruction in Ukraine, Our Ukraine [associated with President Yushchenko] and Batkivshchina [Fatherland, party of Yuliya Tymoshenko]. The Crimean branch of the Communist Party was always as much Russian nationalist as Marxist-Leninist. An escalation of the crisis in the Crimea would be very different from the 2008 conflict in Georgia, for four reasons. First, the Crimea has never been a frozen conflict, in the way that other disputed enclaves became, and has always been under Kyiv’s control. Moreover, legal mechanisms for breaking away do not exist, and votes in the national parliament would be overwhelmingly against such a move. Second, Ukraine has substantial military and security forces in the Crimea. This is again different from frozen conflicts where Russia has been involved: Georgia, for instance, had no troops in South Ossetia. Ukrainian naval, border and security forces would put up a strong defence of sovereignty, as earlier witnessed in autumn 2003 when they were mobilised during the conflict with Russia over Tuzla island, which lies off the Crimea. Third, the Crimea has a large pro-Ukrainian Tatar minority who would also resort to paramilitary tactics, and possibly terrorism in the event of a breakaway. Tatars are shaped by their historical memory: over half of them died during the 1944 ethnic cleansing by the USSR. Because Crimean Russian nationalists, the Party of Regions and the Communists continue to support the Soviet justification of ‘Nazi collaboration’ for the ethnic cleansing, relations between the parties are very poor. In fact, more Tatars served in the Soviet army than collaborated with the Nazis; after returning home they too were deported. Finally, Russian covert and overt support (the Black Sea Fleet has such a large number of personnel in the Crimea that it is impossible to distinguish between the two) for a Crimean breakaway from Ukraine would have implications for Russia’s relations with Europe, the US and international organisations. Such a step would be seen as infringing the cardinal doctrine of the territorial integrity of states in international relations, which Russia has long pursued in its ‘anti-terrorist’ campaign in Chechnya and its condemnation of Western support for the independence of Kosovo from Serbia. The danger for Russia, then, in supporting separatism in the Crimea, is not that it might not succeed, but that if the Crimea can break away from Ukraine, then, it might also be asked, could not other independently-minded regions in Russia do the same? [i] Taras Kuzio, ‘Crimean Tatars Divide Ukraine and Russia’, Eurasia Daily Monitor, volume 6, no. 121 (24 June, 2009). [ii] T. Kuzio, ‘Ukrainian-Russian Diplomatic War Intensifies’, Eurasia Daily Monitor, vol.6, no. 158 (17 August 2009) and ‘Russia-Ukraine Diplomatic War,’ Eurasia Daily Monitor, vol. 6, no. 147 (31 July 2009). [iii] T. Kuzio, ‘SBU Challenges the FSB in Crimea’, Eurasia Daily Monitor, volume 6, no. 134 (14 July 2009) and ‘The FSB Returns to Ukraine’, Eurasia Daily Monitor, vol.7, no.100, 24 May 2010. [v] “Ukraine: The Russia Factor in Crimea – Ukraine’s “Soft Underbelly?” US Embassy Kyiv, December 17, 2006. http://wikileaks.org/cable/2006/12/06KYIV4489.html. [vi] T. Kuzio, ‘Islamic Terrorist Threat in the Crimea’, Eurasia Daily Monitor, vol. 6, No. 223 (4 December 2009).